The clear, lovely varnish is orange-brown, slightly shaded, and the tone and workmanship are first-rate. 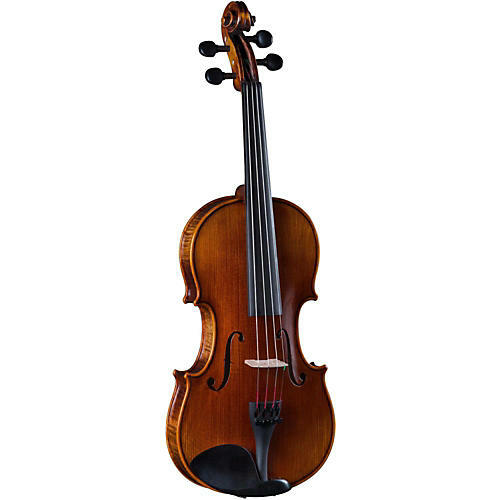 Supplied with a lightweight, 4-tuner tailpiece and D'Addario Prelude steel strings, this violin offers the best tone quality for the advanced student. This outfit comes complete with a genuine horsehair bow, a hardshell case and violin care products. Of the many available student violin starter kits available, this one merits particular consideration. Cremona is a respected brand, and the final inspections on these instruments are made by expert violin makers. Each instrument is setup to Cremona standards at their U.S. workshop and is ready to play the day they arrive, adorned with all of the extras you need to get started. There many things that can interrupt a student's development on his or her instrument. The Cremona SV-500 will not be one of them. Order today and give your musical journey the chance it deserves.